In the early days of Daren Hornig’s brokerage career two decades ago, when it came to development opportunities “it was Manhattan and Manhattan only.” Since Hornig is now actively developing in the outer boroughs, it’s clear that matters are different today. 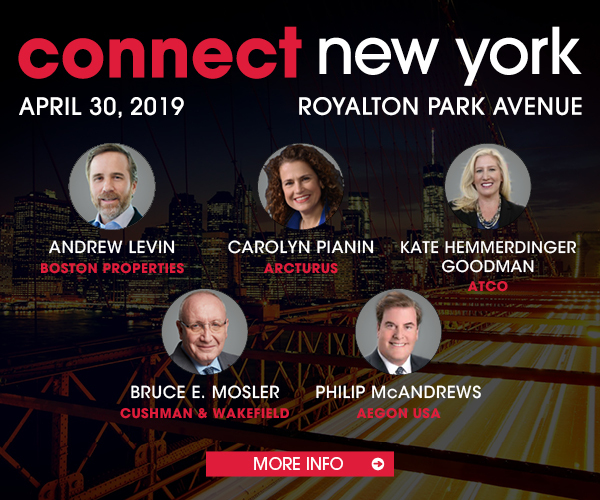 New York City’s evolution, and its capacity for reinventing itself, underpinned the conversation at this year’s Connect New York conference, which drew about 200 industry professionals to Brookfield Place in Lower Manhattan. Over the course of Tuesday afternoon, the audience at the well-attended event heard from the experts on subjects ranging from the boroughs’ development boom to the many ways in which the office environment of 2018 is transforming. Moderator Philip Russo of MetaProp observed that when it comes to adopting technological advances, the residential sector has been earlier to the party than office users and owners. Now, he added, commercial landlords—and occupiers—are making the effort to catch up with their multifamily counterparts, although panelists agreed that different organizations are at different points along the learning curve. And, while larger organizations have often gotten on board the tech bandwagon earlier than smaller ones with less room for costly trial and error, that isn’t always the case. A panel titled “East vs. West: A Seismic Shift in Manhattan” (pictured) pitted the recently rezoned East Midtown against the Far West Side, a neighborhood that essentially was invented through a 2005 rezoning that brought commercial and residential development to a section of Manhattan that offered little more activity than the 24/7 movement of trains in and out of rail yards. However, moderator James Wacht of Lee & Associates wondered aloud whether the title wasn’t a misnomer. Instead, he suggested, it could be called “Rebirth & Renewal,” a process that has played out citywide over the years. It’s a process that offers plenty of room for more than one submarket. “We’re big believers in the East Side,” said Brookfield Properties’ Duncan McCuaig, whose company is developing Manhattan West, one of the signature mixed-use mega-projects now in progress on the Far West. And, it opens up new opportunities in the face of millions of square feet of new class A office coming on line. By and large, New York’s story is one of strength, as moderator Arthur Mirante of Avison Young made clear. The city’s population is at an all-time high, while unemployment is at historic lows. The office market is at a point of equilibrium between supply and demand, while tourism continues to set new records. “We are at a moment in New York where we’re reaping the benefits of 25 years of investment” in areas ranging from economic development to public safety, said Lendlease’s Melissa Burch. However, she pointed out that more investments need to be made, in areas such as infrastructure. Fittingly, given that Tuesday was ostensibly the deadline to file tax returns, Marc Wieder of Anchin, Block & Anchin gave a special presentation on the commercial real estate implication of the tax overhaul signed into law by President Trump this past December. Wieder jokingly said that his 15-minute talk would not cover all 1,000 pages of the Tax Cuts & Jobs Act. Instead, he zeroed in on what he described as the seven most significant points of the TCJA for commercial real estate. Check back over the next few days for more in-depth coverage of Connect New York.